Overwatch's Mei to get a new Legendary "early next year"
After fan complaints that her Winter one isn't good enough. Overwatch's Mei has received a new Legendary skin as part of the game's Winter Wonderland event, and a player named 'Daddy' isn't happy about it, stating that "it's clear that the majority of people do not like that skin, and feel that it is inferior to all of the other legendary skins in the game". Daddy also feels that "someone from Blizzard needs to respond to the criticism of the Mei skin, and clarify what exactly defines a legendary skin". That's par for the course for a thing on the internet, of course, but in this case the grumbling forum post has received a reply from Overwatch Game Director, Jeff Kaplan. 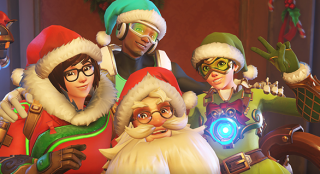 The main takeaway is that Blizzard has a new Mei Legendary planned for "early next year", so if you're unhappy with the seemingly innocuous Father Christmas outfit seen above, know that there's something "pretty awesome" on the way soon. "Hi there. Sorry you are disappointed with Mei's winter skin. We don't have a specific rule for what makes something Legendary or Epic. We just sort of make a gut call based off of what we think is cool. Coolness is very subjective, and based off of the community reaction it seems like our gauge was off on this one. Our reasoning for it being Legendary was that we completely redid the visual effects for Cryo-Freeze (we turned the ice block into a snowman). We thought that was pretty special and we had done it specifically based on community suggestions from months ago when people were speculating that we might have a winter event. Apparently, lots of people don't agree with us and that's ok. It's all good feedback and we're learning something for future events. "For people concerned that Mei is not going to get another Legendary for a long time, you need not worry. We have something pretty awesome for her early next year. "Apologies that our 'cool meter' was off from yours on this one. We'll try to align better on future content."